So today was yet another day where I was fumbling cluelessly, with no clue how to find the line between playing-and-exploring with a tiny bit of guidance (good), and pushing-and-instructing (bad). 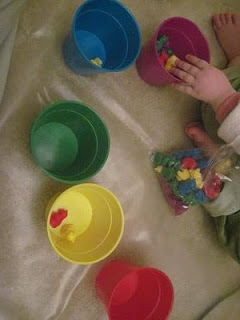 We started out with the Counting Bears ($1 at the dollar store, that wonderful source of cheap tot-school delights). Basbusa loves these guys, because they make a lovely clattering sound when she pours them from cup to cup. When we've used them before, I had plans to try some color sorting, so only put two colors out, but all three times, the joys of bear-pouring completely eclipsed all other possibilities. So this time around, I decided to just go with the flow (of bears), and just let her go nuts with the pouring, while chatting with her about colors a bit as she did it. Bears were poured back and forth, with much delightful clattering. And then she put a yellow bear in a cup, hunted around a bit, found a second yellow bear, and put it beside the first one. Hmmmm... Spontaneous sorting? Or complete coincidence? I had no clue, but I thought I'd see if we could keep going a bit. So asked if she could find me another yellow one. She did, but wanted to put him in a different cup. From here on, I'm not sure if I took the right direction or not. I got a bit more involved in giving directions, encouraging her towards the cup we were sorting into when she had found a yellow bear, and, when she picked one of another color, saying something along the lines of "oh look, a red bear! How pretty. But let's not put him in with the yellow ones. Look, see how he's a different color?" 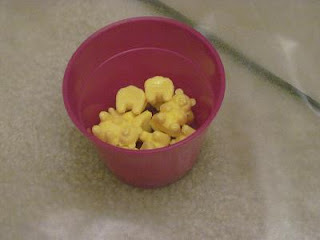 All the yellow bears in the purple cup. Is this a picture of a successful learning experience? Or of childhood exploration being squashed by a narrow-minded, pushy mother? I don't know. I'm sure she's not warped for life - yet - but I wish I had more clue what I'm doing. At least it was good pouring practice, until Mama decided to stick her big nose in. Next up was her number puzzle. This is another one where I don't know what I'm doing. So far, she hasn't gotten the hang of puzzles. She can get the pieces close-ish to where they're supposed to be, but she doesn't know how to put them in place, and isn't very interested in trying. With this puzzle in particular, though, we have a game she likes: I sing the chorus of her favorite number-song in Arabic, pointing to each number as I sing it. She steals a number, and then when I get to that point in the song, I make a big deal of being surprised and astonished and confused that I can't go on with my singing. Much giggling ensues, and it gives me plenty of chances to repeat things like, "... six, seven - oh no! where's the 8? where did the 8 go? here's the place for the 8, right here, but the 8 is gone!" Sometimes I go on to, "Basbusa, do you think you could put that 8 back in it's place? So I could keep singing my nice song?" She makes an attempt, but isn't that interested, so I usually leave it at that. I don't think she gets the point, and it seems silly to go through motions that are meaningless to her. So, maybe my baby just hasn't gotten to the "puzzles" stage of development yet, or maybe I'm failing to endow her with puzzle-solving skills. Anyone know? Labels: colors, numbers, sorting, tot school, tot school gone wrong? It didn't work out phenominally well, though. I was using a kind of mini-peg-board thing that that my husband picked up at a flea market. Basbusa has played with it several times before, sometimes just with pegs to put in and take out, and sometimes with elastic bands for looping around the pegs, but she hasn't been wild about it either way (read: lost interest after about 30 seconds). This time, I was hoping we could put all the blue pegs in one board, and all the red ones in another. Basbusa had no interest whatsoever in this plan. So far, she has had the same reaction to any sorting activity, no matter how appealing the materials. I don't really understand it, because she does seem to get the concept in other contexts - she can pick all the peas out of a veggie mix with no problem, so as to avoid eating any corn, for example. (That's "sorting," right?) But when it's a goal for its own sake, she either doesn't get what I'm talking about, or else has some objection to doing it, I'm not sure which. Maybe she just doesn't see the point? 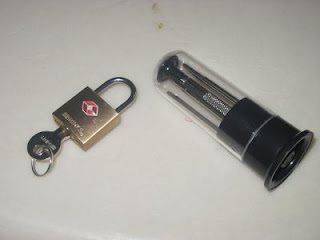 A padlock and a mini-screwdriver set (I think it's supposed to be an eyeglass repair kit). She spent forever practicing putting the key in the lock and taking it out again, and then opening and trying (unsuccessfully) to close the padlock itself. The screwdriver set has five teeny-weeny little heads, which she took out of their holders and replaced about five thousand times, before figuring out that they could each be inserted into the screwdriver-handle, opening up a whole new world of putting-in-and-taking-out. Labels: fine motor skills, tot school, tot school gone wrong? Yesterday we started off with a (cheapskate) version of beading: cheerios on a (new) shoelace. I'd seen many varieties of beading activities on other blogs, which all seemed to go well. Basbusa loves cheerios, and is a huge fan of plugging cell-phone-chargers into cell phones or computer-headphones into computers, so she should love this one, right? Well..... not so much, it turns out. She put a few cheerios onto the lace, and was quite enthusiastic about taking the cheerios off the lace again, when I did a few demo-beadings, but it wasn't long before she was pointing to all her favorite animals on the alphabet chart and feeding them cheerios instead. "Llama! eat! nom-nom-nom-nom... Donkey!! ee-awwww, ee-awww.... eat! Donkey! nom-nom-nom." 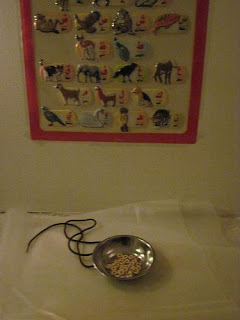 Once the animal alphabet chart had had its fill of cheerios, she pointed up to where I had ever-so-sneakily hidden activity number two (note to self: be sneakier in future), and said, "Rice!" Ohhhhkay then. Rice it is. We've done this one once before. Again, I was envisioning all kinds of pouring and scooping activities the first time I tried it, inspired by blogs everywhere, so I had collected a variety of spoons and scoopy-things and cups. Result? Confusion. Basbusa was keen on investigating the rice, but all the scoopers and stirrers seemed to get in the way of whatever plans she had in her little head. I was sure, at the very least, that she'd enjoy learning how to scoop up a big cupful of rice and pour it back into the bowl again; but no, what she wanted was to use her hands to transfer rice from the big bowl into a smaller one. So this time, I was smarter: we had a big bowl containing just rice and one little bowl. She loved it! And it was fascinating to watch how many things she learned just with those simple tools. She spent the first ten minutes or so just transfering rice again, finding out what kind of hand and finger-motions worked best for picking it up and carrying it, and which worked best for pouring it out again. (I'd never noticed - the sound of rice falling quickly is actually quite different from the sound of rice falling a few grains at a time.) And what worked best for the little bowl? Holding it in her other hand? Putting it inside the big bowl (my favorite)? Putting it on the floor beside her (her favorite - me, not so much... rice everywhere...)? Play resumed after we had had a discussion about having to pick up the rice first, and that we'd be playing with the rice again afterwards. This sequence of events seemed to make a big impression, because she was being much more careful when she got back to her rice-excavation, trying out different motions to see how she could toss the rice around without letting it fall outside of the bowl. So, a successful session overall, I think? Don't know what went wrong with the cheerios, but I'll give it another try in a few days. 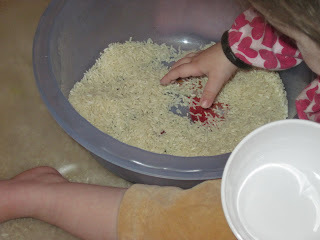 And the finding-things-in-rice seems to have been a big hit - maybe I should try one of these I-Spy bottles that are showing up all over the tot-school blogosphere? When I first started reading tot-school blogs, I was always interested in hearing about the mechanics of how the process worked, especially with very little babies (Basbusa isn't quite one and a half yet). So, in case anyone else is wondering the same thing, here is how we're going about tot-school at the moment. Our apartment is a one-bedroom, so we don't have anything remotely like a dedicated schoolroom, or even a school area. 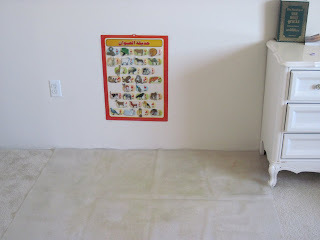 What we do have is a big plastic mat, and an Arabic alphabet poster on the wall of the bedroom, at toddler-height. So when it's time for school, we spread the mat on the floor beside the poster, and that's our school area. I'm hoping that having a defined space will both signal to Basbusa that we're about to start activities, and help to confine the mess when we're using something that spills or sticks or stains. Basbusa can get up and wander off whenever she likes, but the materials we're using stay on the mat. I think it's working so far: yesterday, I when I said, "Hey, want to go do some school? ", Basbusa said "School! School!" and ran to get the mat out from under the dresser. In terms of length, once she loses interest in the first activity - after thirty seconds or after fifteen minutes - I bring out the second. Once she's done with that one, then we're finished with school for the day. Or, once she hears Baba doing something interesting in the kitchen and scampers off to investigate. Or if I've timed things too close to bedtime, and she starts fussing and yawning in the middle of it. So far, our "tot school" sessions have ranged from about ten minutes to about 40, if I happen to pick two things she loves and the timing is right. I'm very interested to hear what other moms are doing (or have done) with their under-twos in terms of set-up and timing? So yesterday evening, after a million delays in leaving the house, we didn't start our errands until 6:30pm. As I tucked Basbusa into her carseat after the second-to-last stop, I told her we were going to the library next. "Library? Library?" Yes, 7bibet mama, the library. I then proceded to get lost twice, with the result that Basbusa was fast asleep and deep in dreamland by the time we arrived at the library at almost 8pm. Awakened by a freezing blast of wintry air as I opened the door, she was less than thrilled, and began to protest vigorously, until I said we were at the library. We spent 45 minutes browsing among books and playing with the puppet theater in the toddler area, and came away with a stack of new selections. I strapped her back in her carseat, and before I had made my way around to the driver's seat, she already had her nose stuck in a book. Also: Huge thanks to our glorious local public library, which is actually OPEN at 8pm! Bless them. Inspiring as all my bookmarked mama-blogs are, there's one area where their creativity points to a hole rather than a highlight in my own tot-school plans: holiday crafts. I can't even count the number of adorable, fun, holiday-spirit-infused, toddler-friendly Christmas crafts I've seen posted over the past few weeks, everything from Rudolph sugar-cookies to personalized tree decorations. I'm sure when Easter rolls around, there will be eggs and bunnies galore! But so far, at least, my list of possible Eid-related crafts is ... well... isn't, would be the best way to put it. So, ok, let's say it's an opportunity rather than an obstacle. I can use the next few years to be on the look-out for ideas I can adapt, and by the time Basbusa gets old enough to have a clue what the heck a holiday even is, I'll have a whole list of fun projects lined up (insha'Allah). And what about Halloween and Thanksgiving crafts? Hmmm. I know the orthodox answer on Halloween, in any case, although I haven't completely figured out my own position yet. But Thanksgiving? Should be fine, right? Can anyone see anything haram in a toddler making a bunch of turkey-related handprints...? Although I translate Basbusa's comments for the purposes of this blog, she actually speaks Arabic, since that's the only language we use with her at this point. My own first language is English, and although I enjoyed the various languages I studied at school at various points, I didn't start learning Arabic until my senior year of college. After a bunch of studying, a whole lot of immersion in Arabic-only environments, a master's degree, a husband who spoke no English when I met him, and a job focused on translating Arabic newspapers, I'm now fluent (more or less) in Egyptian Arabic. My husband didn't start learning English until a few years ago. Since we're living in the US, we're speaking only Arabic with Basbusa (if/when we move back to Egypt, I'll switch over to English-only). She gets exposure to English from my parents and sister, and, as she gets older, from the whole rest of the world around her, I'm sure! I'm writing this post as a reminder to myself, which I fear will be all too necessary: that the point of Tot School is not to teach Basbusa her letters and numbers faster than anybody else!! That is not the point! NOT what we're aiming at! Are we quite clear on that? Yes? Good. Am I going to forget this every single time I read about another toddler who is writing a doctoral thesis already? Probably. And then what am I going to do? 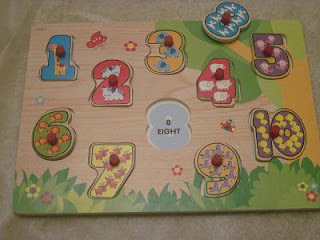 Go running to pull out the letter-matching games and counting bears? No! I'm going to re-read this post and remind myself, yet again, that winning the academic-smarts race is not the point. She's one and a half. She has no need whatsoever, for reading or number skills at this point. She does not have a checkbook to balance; she does not need to read street-signs as she drives around the apartment on her plastic car. What she does need is to learn how much joy there is in books; how many fascinating patterns and connections there are in the world around her; and the confidence that she, too, can enjoy the process of creating things. That's the point. Note to self: please take note of note to self! Welcome, to anyone who has found there way to this blog - especially my sweet Basbusa, if it is you who are reading it years from now. Half of the purpose of this blog is simply a baby-diary of my little girl's first few years. Why in a blog? Because I've done a pathetic job of keeping track of "first moments" so far, and the baby photos are in a jumble spread over three computers. I'm hoping that a string of nice, short, auto-dated blog entries will make things easier to remember. The other purpose is to document our experiments with "Tot School" (for the definition and prime example, see Clarissa's amazing site.) Basbusa's not quite one and a half yet, so we needn't be in any huge rush to find the perfect pedagogical solution! Over the past month or two, though, I have been reading a collection of tot-school mom-blogs (see list in the sidebar) which are truly inspiring. Lots of fun, lots of bonding, and a tot who knows all kinds of things about numbers and letters and nature and art? Definitely worth a try, especially now that I'm cutting back to part-time work and will actually get to spend more time with Basbusa on weekdays. So far, though, I've found that being super-tot-school-mom isn't as easy as it looks, from the delightful posts and pictures I had been enjoying on other blogs! So this blog will (I hope) be a resource for anyone else who, like me, is starting from a point of optimistic cluelessness, or who wants to try Tot School in Arabic. I'm imagining that it will be a series of "hmmmm, well now, that didn't go as I was expecting" posts, interspersed with a steady supply of sugary, in-mom's-eye's only, "my baby is so smart!" stories. Hope you enjoy it, and comments, advice and questions are always welcome!